Unitarians believe the striving to live nobly and constructively more important than the accepting of religious creeds. Unitarians are convinced that religious truth cannot be contrary to truth from any other source. Unitarians offer a religious program for children and adults of all cultures, with reason as our guide, and service as our aim. Unitarians believe that the great end in religious instruction is not to stamp our minds irresistibly on the young, but to stir up their own. Several dozen people attended his talk on March 26, and by the end of the evening nearly 40 of them had signed up to found the Unitarian Fellowship of Northern Westchester. They elected a steering committee and recruited a committee for religious education of children, chose a next meeting date and got to work. The new Fellowship invited a variety of speakers on relevant topics of the day, and eventually hired part-time ministers to provide Sunday worship. A Sunday School program was established for children, and the congregation began engaging in service with local agencies helping the community. For our first few years, our congregation met at a variety of sites in Mount Kisco, Pound Ridge and Bedford, the Bedford Hills Community House, the Mount Kisco Boys’ Club and Conant Hall in Pound Ridge. In 1962, we moved our Sunday worship and religious education program to the Cisqua School in Mount Kisco, across the street from our current location. In 1963, we purchased six acres of land on Bedford Road in the portion of the town of Bedford still served by the Mount Kisco post office. It would be a number of years before we could build our home there. The Fellowship’s current building was completed in 1970, and dedicated on October 20, 1970. The 1970s and early 1980s were a troubling time for UUFNW. Deep disagreement over the war in Vietnam, discomfort with our modernist building, and a lack of stable ministerial leadership led our Fellowship to dwindle in size. This trend was reversed in the mid-1980s by families moving to Northern Westchester and a commitment by the congregation to supporting full-time ministry. 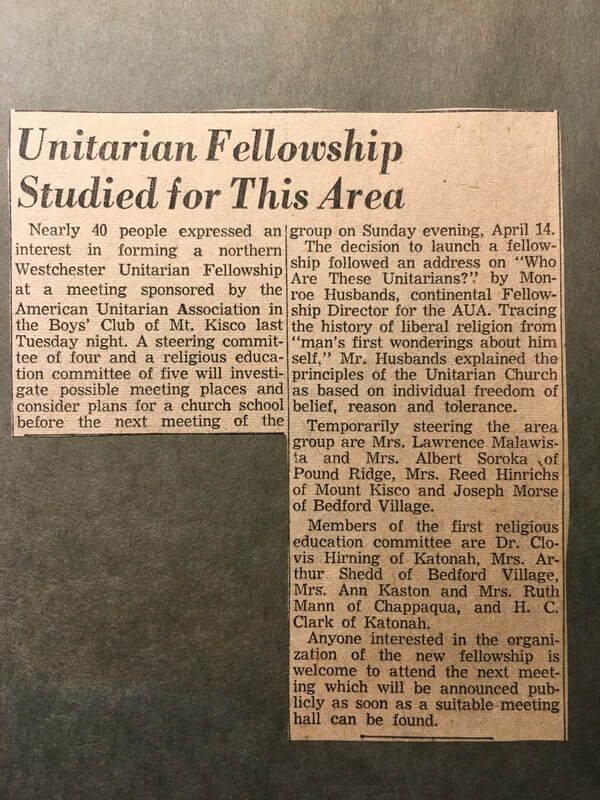 In 2000, we formally recognized our Universalist heritage and became the Unitarian Universalist Fellowship of Northern Westchester. 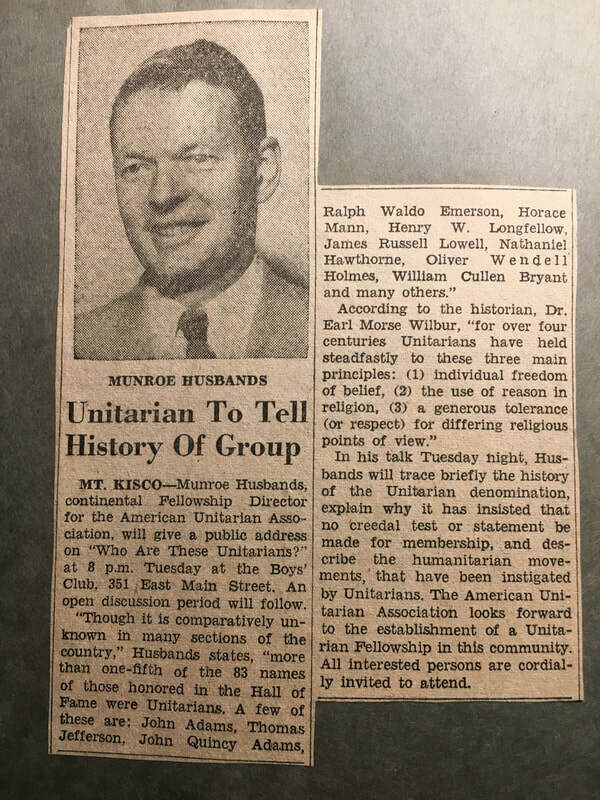 (The American Unitarian Association and the Universalist Church of America consolidated in 1961 to form the Unitarian Universalist Association, of which we are a member congregation.) In doing so, we examined other parts of our name as well. While we were no longer a lay-led “fellowship,” we kept that word because many felt that the proposed alternative, “church,” was unwelcoming to people of Jewish heritage. In 2011, UUFNW was awarded O. Eugene Pickett award for growth from the Unitarian Universalist Association. This honor recognized our significant growth in the previous 5 years, including what was then a 4-fold increase in the number of children and youth at our congregation. In 2013, we informally adopted the four-word condensation of our congregation’s mission: welcome, inspire, share, love. We are committed to welcoming all who wish to be part of a religious community that is open-minded, progressive, and diverse. We inspire one another through worship, spiritual practice, and lifelong learning. We share ourselves and our lives with one another, forming a community of relationships that depends on us all. We spread our love to the world, seeking to transform our society with the power of love and justice. In 2017, we are launching a campaign to bring us into a brighter and more sustainable future. This campaign will feature our dedication to environmental justice through the UUA’s Green Sanctuary program, and a congregation-wide visioning and long-range planning process that will involve our mission, our ministries and our facilities.